Little moments like this have always drawn us to weddings! No matter how much coaching you give a flower girl, she's still just a little girl, prone to her own personal opinions on what should or should not be done. Behave? Maybe. But maybe not perfectly, and we actually think that is perfection. 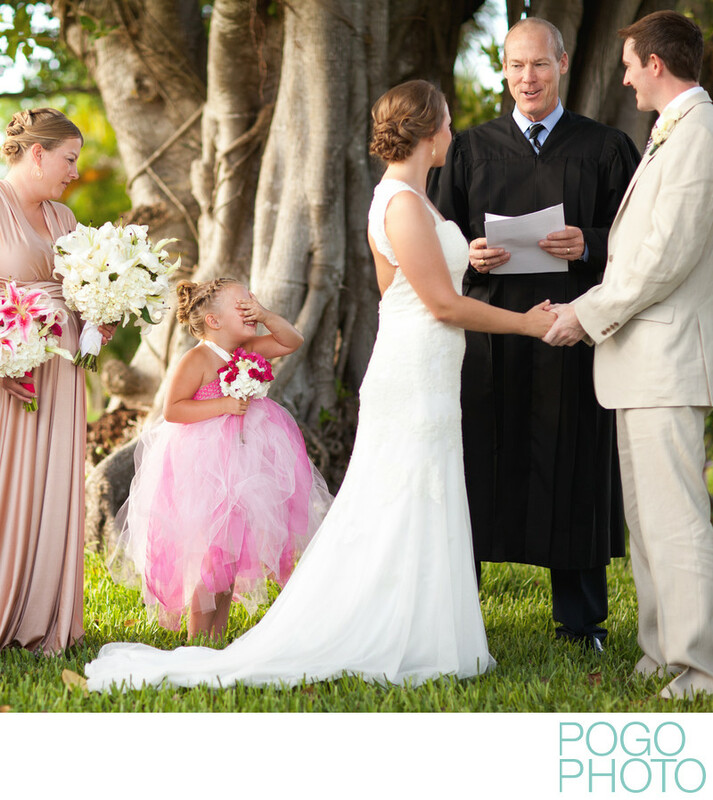 This little girl at Lowery + Brian's wedding on Jupiter Island, just off the coast of Jupiter, Florida, must have seen something she didn't want to see, because she was intent on covering her face for several long moments during the vows! Her sweet pink and white puff of a tutu inspired flower girl dress coordinates beautifully with her mini bouquet, and contrasts with the flowing and shining blush bridesmaids dresses Lowery picked for her maid of honor and the rest of her maids. Backyard weddings in South Florida can be hot, especially when they're in June! This day on the southern tip of Jupiter Island was no exception, but the shade of the enormous banyan tree kept the guests somewhat cooler than in the direct afternoon sunlight. Brian's crisp linen suit kept him cool, and Lowery's simple lace wedding dress and intricate updo were the perfect choices for a hot summer wedding. 1/800; f/2.0; ISO 200; 85.0 mm.